KTE operates 8 direct push rigs (5 truck mounted rigs, 1 track mounted rig, 2 limited access rigs) with capabilities to sample deeper than many conventional direct push rigs. 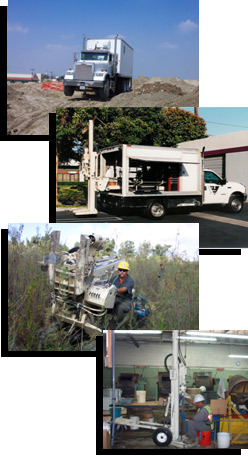 Our limited access rigs are very portable for sampling inside buildings or tight access areas. We also operate two four-axle, 30-ton CPT rigs, which are heavier than most CPT rigs in the United States. Please call if you have questions whether direct push or CPT would be appropriate for your site.